On Monday, I posted a few of the beasts that JR Mounts drew for me to use as summoned creatures for a class that performs magic from a deck of cards. The Card-caster class is part of my contribution to the Tenkar's Landing crowdsourced hexcrawl project...a part of the contribution that is probably so superfluous to the point of the project that it will never be used by anyone, but a part of it nonetheless. As I actually did put some effort into making the class balanced and suitable for dueling (once a sufficient number of cards are created), though, I wanted to also share it here. Any and all feedback is welcomed, of course...I love the idea of turning this into its own little minigame within a campaign, and I'm sure there are a lot of possibilities I failed to consider! 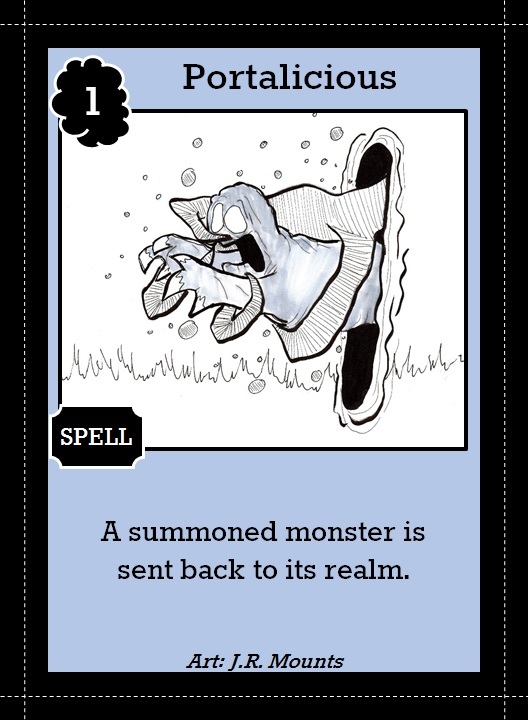 Card-casters are students of the art of card battling, known in the local Hobgoblin tongue as vrakkig. They are capable of harnessing magic using a deck of specially crafted playing cards. While many scholars mock these arcane warriors as incapable of “true” magic, they have been known to hold their own against those who wield the powers of many other traditions. Hit Dice and saves: as Cleric. Advancement, combat, weapons and armor: as Magic-user. Card-casters maintain a collection of playing cards that enable them to cast spells and summon creatures from beyond the realm. This collection may include any cards found, bought, or traded for by the character. Each morning, they will prepare a deck from among the cards in their collection and shuffle this deck well. Card-casters must have a number of cards in their deck equal to three times their Card-caster level. By choice or necessity, any number of these cards may be copies of the card “Next!” It is a Level 1 Spell that simply reads “Draw a card,” and is known among Card-casters and collectors as a super-ultra-basic-common…that is, there are tons of them around, and no one would really mind if a Card-caster just made their own copies anyway. Other than “Next!”, all cards in a Card-caster’s deck must have unique names. All but ONE (at maximum) card must have a Card Level equal to or less than the Card-caster’s level. 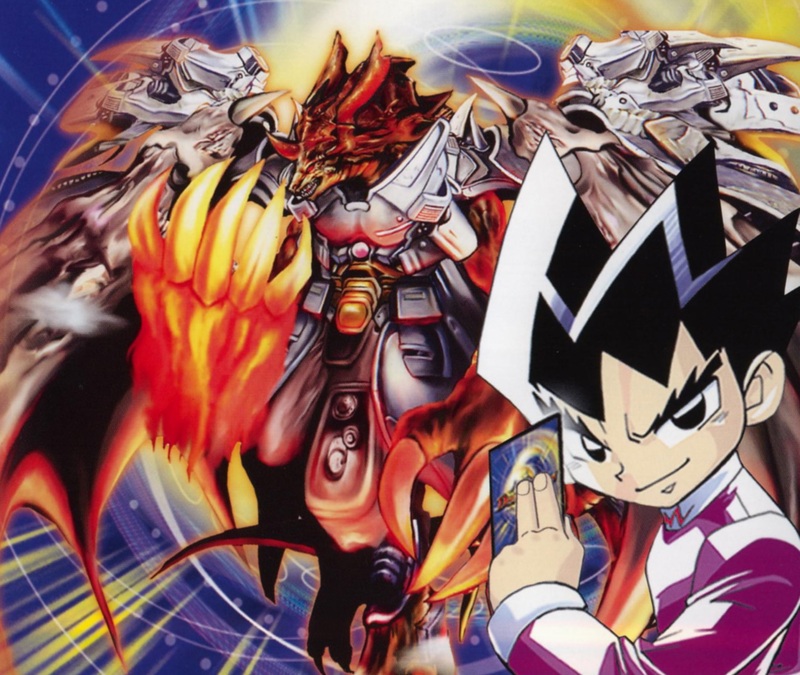 At the point in the day in which a Card-caster wishes to initiate card battling, they immediately draw an opening hand equal to ½ their Card-caster level, rounded down (minimum of 1 card). 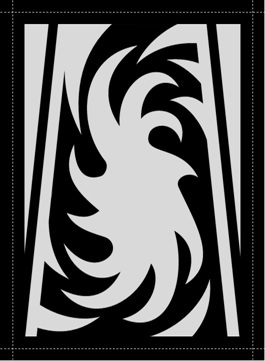 At the beginning of each subsequent round, they draw one card from the top of the deck and are then able to take their action or actions for the round. Attempting to cast a card takes one round of action. A Card-caster may, in place of attempting to cast a card, discard as many cards as desired and draw that many. Those casting a card (including other adventurers who come into possession of magical cards) have a casting power = 10 + their Card-caster level. 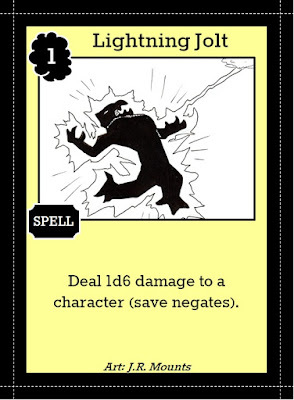 Cards have a Level equal to Hit Dice of the monster or the number indicated in the upper left corner of a spell card. When a card is cast, roll 1d20 and add the card’s Level. If the result is higher than the caster’s casting power, the card fizzles. Once a casting attempt is carried out, whether or not it is successful, the card is sent to the “discard pile,” an interdimensional pocket that keeps cards in near-mint condition until they are accessed again the next morning. (All cards discarded for any other reason also go here.) The one exception to this is when a monster is returned to its realm of origin, in which case the monster’s card returns to the hand of its summoner. When the deck is depleted, the character cannot cast any more cards unless something happens to put discarded cards back into the deck. Summoned monsters return to their realm, and all spell effects end, 1 hour after last card is drawn from the deck. This is an interesting class and I think it works. Now the Card-caster needs some spells to create additional minigames. I could run a fantasy campaign without the players ever having to consider a non-minigame-oriented objective! Time... It's become such a valuable commodity for many of us that we base all of our daily generator vbucks around how much time we have to spare. I'm sure we've all had to cut something out of our daily routine just because there's not enough time. When you're a young adult like me, with a full time job and other responsibilities, it's honestly quite hard to find time to play video games, which is a pity because I love video games. This list is designed to show you which game genres take the most time to play through, starting with the least. Time... It's become such a valuable commodity for more info of us that we base all of our daily activities around how much time we have to spare. I'm sure we've all had to cut something out of our daily routine just because there's not enough time. When you're a young adult like me, with a full time job and other responsibilities, it's honestly quite hard to find time to play video games, which is a pity because I love video games. This list is designed to show you which game genres take the most time to play through, starting with the least.